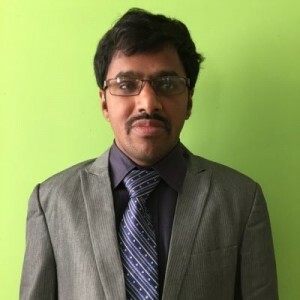 Srinivasu Chakravarthula – studied in the area of Computer Science and digital accessibility and is certified in ‘assistive technologies’. Has been in the accessibility industry for 12+ years and passionate about raising awareness about accessibility, turning reactive customers to proactive customers. Accessibilty is not just his profession but something very close to his heart. Joined in 2016 to lead accessibility initiatives. Portfolio includes helping teams to make Informatica products accessible, raising awareness to both internal and external stakeholders, help teams to up-do-date about accessibility standards and best practices. At Deque I assist customers to make their products accessible and meet industry standards. In addition to help them with assessment reports, contribute efforts to create awareness about accessibility. Further I’m an active participant to work with services related to Government of India. He started his career as Head of the Braille Production Unit at National Association for the Blind, Karnataka Branch, Bangalore. He then moved on and taught Computer Science at The Manik Public School, Bidar and also set up the Computer Training Centre at Hyderabad and Maniknagar, Bidar. In the year 2005, he began to specialize in accessibility and started working for Net Systems Informatics India Pvt. Ltd. and its subsidiary – BarrierBreak Technologies, Mumbai. During his stint at Net Systems, he was instrumental in accessibility testing, imparting accessibility training to Corporates, creating awareness about accessibility and assistive technologies. Srinivasu played an innovative role in organizing Techshare India 2008 – India’s 1st Accessibility and Assistive Technologies Conference and Exhibition. He was also Program Coordinator for Magazine, a3 that talked about Ability, Accessibility and Adaptability. Srinivasu further joined Yahoo! India as Senior Accessibility Manager and was responsible to lead and evangelize accessibility and its initiatives across Yahoo! India and South East Asia. As a results of his efforts with his counterparts, Yahoo! India has won NCPEDP – MphasiS Universal Design Award in the year 2010. Srinivasu, during his stint at Yahoo!, awarded the Yahoo! Ratna Award, which is a highest recognition given to employees at Yahoo! India Research & Development for outstanding work! Srinivasu then worked for PayPal – the trusted company for financial transactions and lead accessibility practice. His charter is evangelize accessibility across the company. Srinivasu then built Accessibility Practice at HCL Technologies. His charter including building competency, drive the accessibility related initiatives. During his short stint at HCL, he was contracted with Google to work on accessibility of YouTube, Hangouts and Seach. Srinivasu was a Mentor for OpenAIR contest by Kowbility in the year 2015. Srinivasu was a member of World Wide Web Consortium (W3C) India’s National Advisory Board and NASSCOM’s Disability Working Committee and he is responsible to streamline accessibility related activities. Srinivasu served as a Member of Governing Council, The National Association for the Blind, Karnataka Branch from September 2010 to October, 2012 and was responsible for smooth operations of IT related activities. Srinivasu, actively involves in the activities of eBay PayPal GIVE team that tirelessly put in efforts for the welfare of society as part of Corporate Social Responsibility. He was also a member of the core committee for Yahoo! Employee Foundation India (YEFI). Srinivasu is associated with the social sector through the National Association for the Blind, India; Enable India, Shri Manik Prabhu Sikshan Samiti and Success World. His hobbies include blogging, tweeting, listening to classical music, playing chess and swimming.